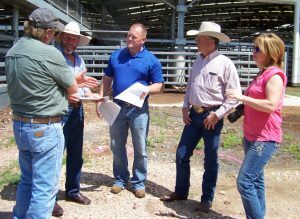 Left to right Darcy Howard, Ted Howard (Stockmanship), Lynn, Dr Kevin Sullivan (Bell Vet Services, PAC Animal handling and heat stress management), Dr Kip Lukasiewicz (PAC Animal handling, field research, and facility design). 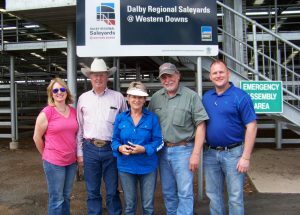 The approval to install a permanent sale ring at the Western Downs Regional Council livestock selling complex introduced some high profile unexpected input. Frank made contact with Dr Kevin Sullivan of Bell Vet Services Queensland, appreciating Kev’s knowledge of animal handling, movement, welfare & psychology. The intent was to cast an eye over the initial concept drawings for flow and workings of stud Santa Gertrudis bulls leaving the display penning with entry & exit into the new sale ring. Kev was happy to offer his advice and said ‘timing perfect’; he would invite some American visitors along who had just arrived into Brisbane. A ‘think tank’ pursued on a Sunday morning with Dr Kevin, Dr Kip Lukasiewicz from Nebraska, Ted Howard from Kansas, Teds wife, Frank & Lynn. The three gentlemen are team members of Production Animal Consolation (PAC) http://www.pacdvms.com/ who are specialist “advisors serving animal protein producers worldwide” combining their talents and skills for the betterment of protein producing species. They gave up their morning generously and some exceptional outcomes were achieved. These practical points of design and flow will be incorporated into the design provided to the Council Infrastructure Management for tendering. Initial input to the design was provided by members of Western Downs Santa Group plus our selling agents Grant Daniel & Long (Dalby). The new sale ring completion is scheduled for June this year. Time enough to have many trial runs and iron out any bumps or technical hitches! L to R. Dr Kev, Frank, Dr Kip, Ted and Darcy on the job!